To conserve power and reduce your electrical bill, you should shut down your computer or put it to sleep when not in use. But that’s easier said than done if your Mac acts as a server for files, photos, music, or other resources. Snow Leopard offers at least one solution to this problem: Wake on Demand. This is Apple’s name for a new networking feature that lets a Snow Leopard Mac go to sleep while a networked base station continues to broadcast Bonjour messages about the services the sleeping computer offers. The base station essentially acts as a proxy for the slumbering Mac. Advertised Bonjour services includes file sharing, screen sharing, iTunes library sharing, and printer sharing among others. When another computer on the network wants to use one of those Bonjour services, the base station sends a special signal over Ethernet or Wi-Fi to wake the computer in question, which then rouses itself and responds. Snow Leopard’s improved speed in waking from sleep helps. To other computers, the sleeping Mac’s shared services appear as regular Bonjour entries requiring no additional software. A Panther, Tiger, or Leopard system or Windows system with Bonjour installed can wake a Snow Leopard Mac. 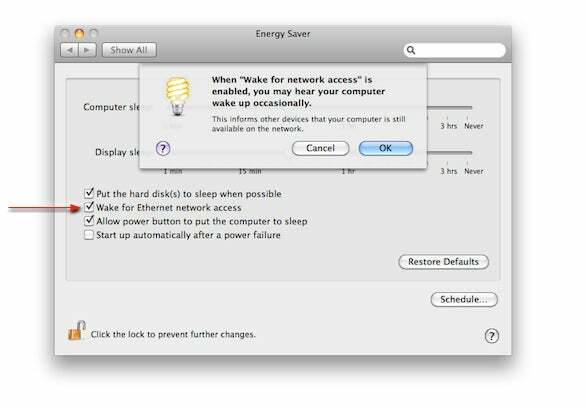 An awakened Mac goes back to sleep according to Energy Saver settings when it returns to an idle status. Wake on Demand is a useful feature for Mac users who share resources between multiple machines, but it comes with some notable provisos. The first is the type of equipment you’ll need. Apple says you must have an AirPort Extreme Base Station (2007 or more recent model) or Time Capsule (2008 or more recent model) with the current 7.4.2 firmware installed. 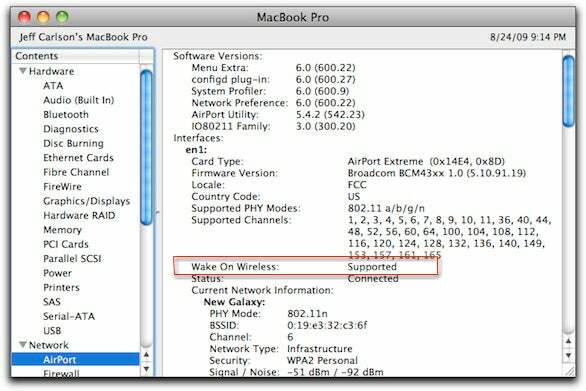 You can check whether your system supports Wake on Demand via Wi-Fi by opening System Profiler (go to Apple menu -> About This Mac, and click on More Info). In the Contents list at left, select AirPort (in the Network section). In the area under Interfaces, look for the text “Wake on Wireless: Supported.” If it’s not there, the option isn’t available on that Mac. This MacBook Pro offers Wake On Wireless. You enable Wake on Demand in the Energy Saver preference pane. On desktop machines, Snow Leopard shows a single pane; on laptops, the option is available in the Power Adapter tab. Laptops can’t use this feature when powered by a battery. Additionally, laptops must either be open (not latched) or have an external display attached to be woken through this method. For computers that can connect over either Wi-Fi or Ethernet, the checkbox is labeled Wake For Network Access. In my tests, this option was turned on by default in updated and new Snow Leopard Macs. Apple notes in a support document that some machines may have this option turned off after upgrading to Snow Leopard, in which case you’ll need to turn it yourself. In the case in which a computer has only the Ethernet option, the label reads Wake For Ethernet Network Access, but the option functions the same way; and if you have a MacBook Air, the option reads Wake for AirPort Network Access. Apple warns in its support note that your apparently somnolent computer may wake for just a moment to check in with the base station that’s proxying Bonjour without activating its display, and then quickly go back to sleep. You can disable Wake on Demand by unchecking the box. With the option turned off, your sleeping Mac will have its beauty sleep undisturbed and your base station won’t advertise the Mac’s Bonjour services. In Leopard and earlier releases of Mac OS X, Apple offered a similarly labeled wake-on-Ethernet option that relied on the Magic Packet, a specially formulated data transmission that Ethernet adapters can be set to listen for in order to wake a computer in a standby mode. The Magic Packet option is a common feature in Ethernet cards and operating systems. The technology behind waking a computer over Wi-Fi is more complicated. Wi-Fi radios typically shut down when a computer isn’t active; however, some Wi-Fi-enabled devices employ a standby scanning mode that wakes a radio for extremely brief periods of time to scan for incoming traffic. This mode typically takes advantage of WMM Power Save, a standard designed to reduce power usage by Wi-fi-capable cellular handsets and portable devices while they’re not transmitting. If Apple has taken an open approach to waking a Mac over Wi-Fi—that includes the use of Bonjour which Apple invented but doesn’t restrict the use of—it’s good news for Mac users. In the coming weeks we may see programs developed that allow other software, servers, or routers to wake the slumbering Snow Leopard.